DARPA anf HAARP New Antenna System. 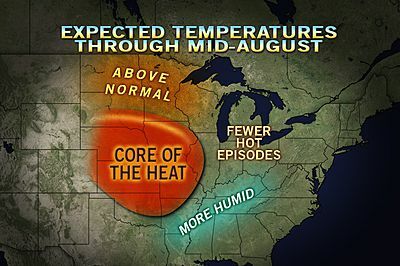 Additional corn crop failures are likely, due to too little rain and too much heat through the middle of August. Spotty downpours will grace northern and eastern areas of the corn belt into August, but not enough rain will fall on a large part of the corn belt, leading to a disaster. 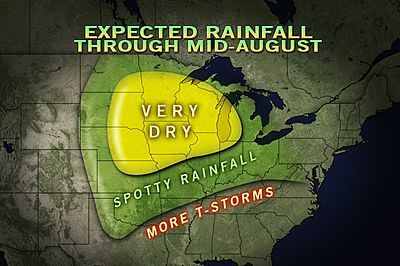 AccuWeather.com agricultural meteorologists feel that a lack of rain will continue to take its toll on non-irrigated corn in much of Nebraska and Kansas, as well as huge sections of Illinois, Missouri, Iowa, southeastern South Dakota, southwestern Minnesota, southwestern Michigan and southeastern Wisconsin. In these areas, a few tenths of an inch of rain will fall here and there in the weeks ahead with some areas barely getting a drop. Most summertime thunderstorms swirl from the southwest, so anything changing this pattern will be felt downstream in the storms. Hence drought in the immediate areas downstream from this new experimental weather modification system, but also very severe storms have been happening just to the north when the moisture plume is shoved away from the antennas power field. In this southwestern and central swath of the corn belt, the combination of too much heat and too little rain moving forward into the middle of August will prove to be too much for corn to take. Essentially, most of these areas are beyond hope for a significant crop this year. 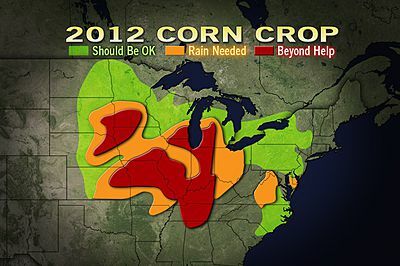 This map shows primary corn for grain-growing areas and the condition of the crop as of July 17, 2012. Since most fields on the High Plains, West and the Mississippi Delta are irrigated they are not as directly impacted by the drought. Also in this time frame we had a major Derecho race across the north boundary of the antenna power force field, moving at times over 80 miles per hour! Wind gusts into the 90 miles per hour range! There is something making this happen. Warnings blocks started out in direct east west fashion downstream of the antenna arrays out west 1 state away. Note the angle of the arrow, follow it back and it is a curve over the north antenna boundary back west. Infared shows how this balloned up and out, takes alot of moisture moved from upstream to cause this. Plus alot of energy into the atmosphere. Lets see HAARP puts out 3-4 billion watts of energy into our atmosphere and is now being directed by this DARPA array? It takes alot of straight line wind to snap large pine trees at the trunk. A family sits in front of their home, see the red front door, right under the big tree branch. How do you tell them the storm was unnecessary and man-made? While these folks play God with weather doing weather modification and bombarding our skys with microwaves (remember what happens to water in the microwave? Vaporizes to somewhere else) many lives are changed when they goof. Untold dollars lost, insurance claims, but what about the people who have no insurance to repair their roofs? The money these fools are using was YOURS, yep straight from your tax dollars at work for you. Now tell the farmers facing a Billions dollars crop loss this year that they payed for the programs that brought their demise of investment feeding us poor saps. Gee i see the similar reference don’t you? Thank you for the post. Sadly, most sheeple will believe in natural causes.